In what is shaping up to be a busy offseason, with rumors swirling about Hiroyuki Nakajima and Yu Darvish, the one confirmed posting we have is for Rakuten ace Hisashi Iwakuma. RJ Anderson called Iwakuma “Andre 3000” during the 2009 WBC, and I said he was Japan’s second best pitching prospect in August. Now that we know he’s coming over, I’ll take a little bit of a deeper dive into what he brings to the table. Iwakuma’s best skill has been controlling the home run ball. His best performance came in his Sawamura Award season of 2008, when he allowed a mere three homers in 201.2 innings for a 0.13 HR/9IP rate. After a more pedestrian 15 bombs in 169 innings last year, he bounced back in 2010, keeping the ball in the yard all but 11 times in 201 innings pitching, good for a 0.40 HR/9IP figure. It caught my eye that nine of his 11 homers allowed in 2010 came in his home stadium, Kleenex Stadium Miyagi, where he threw 118.2 innings. But that looks like an aberration, as I couldn’t find any real evidence of that kind of a home/road split among his teammates. Still, if Iwakuma winds up in a pitcher-friendly home stadium, that could offset the reality that he will face many more players capable of hitting home runs in MLB. 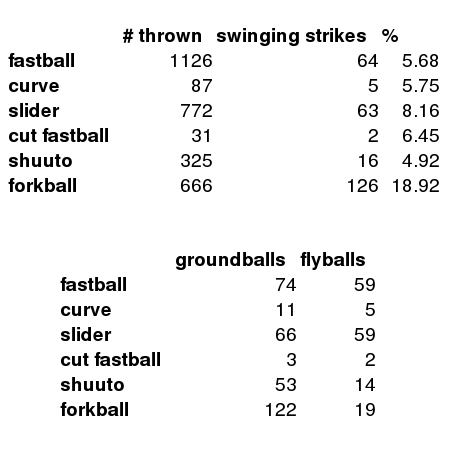 Notes about this data: groundball and flyball data includes hits, shuuto is a cousin of the two-seam fastball, we usually call “forkballs” “split-finger fastballs” in the US. 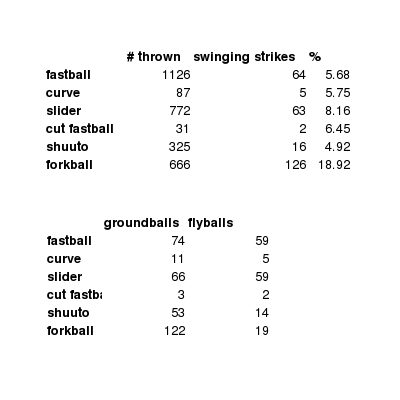 Before pulling this data, I knew Iwakuma’s forkball was good, but I didn’t realize it was that good. 37.2% of the times he threw it, he got either a swinging strike or a groundball. The groudball figure includes 28 hits, but that’s still pretty impressive. Some of those fastballs and sliders that handcuffed NPB hitters are going to get hit in MLB, and some of those forkballs in the dirt aren’t going to get chased. But the data shows that Iwakuma can get all five of his pitches over the plate, including his seldom-used cutter. Now the risk: it’s reasonable to expect a drop in effectiveness and/or command from some or all of Iwakuma’s pitches. I don’t think there is any good way to predict which of of Iwakuma’s pitches could suffer, but Hiroki Kuroda and Daisuke Matsuzaka have notably struggled with their forkballs in MLB. Iwakuma will need to buck that trend to approach the level of effectiveness he experienced in Japan. The other, more generic question mark also applies: can he withstand the more demanding MLB schedule? He’s thrown 200 innings in two of the last three years, but he’ll have to adjust to starting every fifth day instead of once a week, pitching to better competition and a more demanding travel schedule. In 2010, Iwakuma averaged 107.61 pitches per game, so his workload on a per-game basis was not out of line with MLB norms. I think that will work in his favor. I’ve been asked a couple times already how much I think his posting fee will be, and how much it will take to sign him. Iwakuma carries some risk, but overall I would put his upside in the mid-rotation starter range. I think there is a lot of variability in how MLB teams will evaluate him, so I’ll put the over/under for his posting fee at $10m, and his contract at four years, $20m. We hoped you liked reading Thoughts on Iwakuma by Patrick Newman! Yes, there are “many more players capable of hitting home runs in MLB,” but that’s only part of the problem, isn’t it? It’s my impression that for hitters, HR/SLG doesn’t project well at all from Japan to the US. If that’s also true for pitchers, then a guy whose “best skill has been controlling the home run ball” becomes very hard to judge. On that basis Iwakuma might appeal to a particular type of team – one with a lower-mid to mid-range budget that needs pitching, and will take a limited risk for it. Hmmm…. I believe you just described, Arizona. Or Chicago.